Some indie game projects take years to wrap-up, as real life and circumstances, or perhaps changes in design, prompt delays. Aztez seems like an example of that, having been in the works for over four years, but is now finally out on PC. It looks like an intriguing game, with a mix of gory combat, empire building and resource management. The one minute video below provides a handy summary. We saw this via Eurogamer, which intrigued us as it was stated that the game is coming to the Wii U. However, those of you thinking the now last-gen system is getting a neat eShop title may be disappointed / pleased to hear that the developer is instead hoping to 'pivot' over to Switch. It may not come soon, frankly, but below is an excerpt from the developer's most recent blog post. Any time I hear the word "pivot" I immediately think of Friends and that episode with them carrying the couch up the stairs. And the game itself reminds me of MadWorld. It's like Actraiser meets Madworld. I like both genres, hope the combination is pretty fun! Would this lend itself to a co-op campaign? A phone sounds like the best place for this one. Sounds like it's trying to do too many different things. Looks enjoyable. 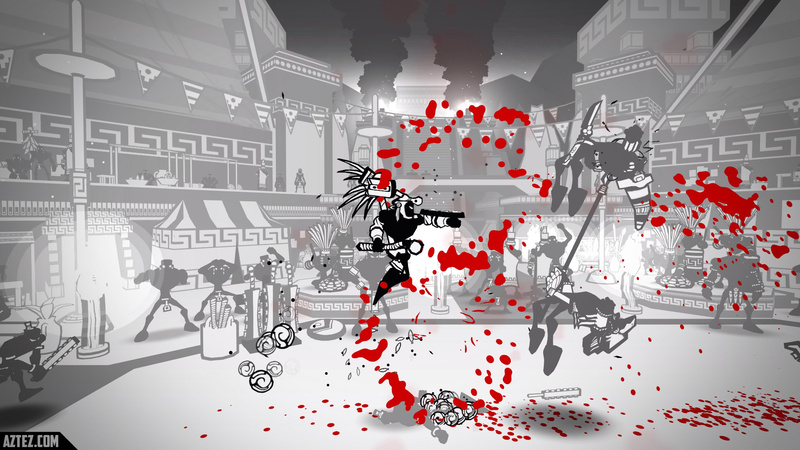 The combat looks fluid, and the game is all about the Aztecs which is a civilization that has been woefully unused. Looks like a 2D version of Madworld with a bit of Romance of the Three Kingdoms and Nobunaga's Ambition add to the strategy aspect. I may eventually check it out if it ever reach Switch. Looks pretty cool. Also makes me wish for an HD MadWorld. You aren't the only one think that. Guess that people were saying it enough that the devs came out and said a while back that this was in planning before Madworld was ever revealed. The Wii U is a lost cause, port it to Switch instead. I'd certainly grab Aztez for my Switch. Perhaps my Vita, too! This looks freaking amazing, like civilization with combat you control! @EDF Hey man, I just watched the Pato Box trailer. It looks awesome! I'll definitely keep an eye out for it now. Thanks for the tip, buddy! Looks interesting (and a bit like Madworld).